I met with the good Paul Pope the other day, in a rain squall, for rye and red wine. I drink rye. 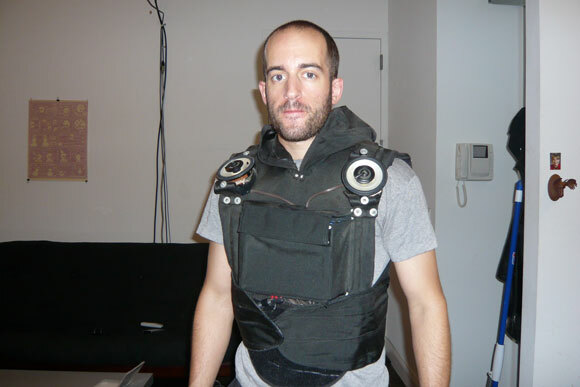 Amidst our conversation, I was reminded of some wearable soundsystems I prototyped during my Providence days. I envisioned car stereo systems in jacket and vest enclosures - ungrounded (and admittedly dangerous) ghetto blasters strapped to the chest and back of their users. I wanted to launch a mobile bass awareness campaign, and moreover, I wanted to have a sound source on my person for my electronic music performances as handshake. The first, Performance Model A, was well-loved and well-used. It was 1050 denier ballistics ripstop nylon around a core of heavy mylar and neoprene. It had a tactical vest form factor with a military aesthetic. On the shoulders, forward-facing, were cold-riveted two 3.5" speaker/tweeter combo drivers. It was driven by a car amplifier mounted on the chest and powered by two 12V, 5Ah sealed lead-acid batteries. The result, after some sun damage and a few years kicking around closets. The next step was to incorporate a subwoofer. But, as any 50Hz head will tell you, a sub alone does not bass make. You need an enclosure. Departing from the tactical vest aesthetic, we decided on a combined 'backpack/vest' form factor - Performance Model B, was to be a vest, similar to Model A, but with a fiberglass sub enclosure housing an 8" subwoofer, a more powerful amplifier, and an active crossover unit to handle signal for a 5.25" chest-mounted, fiberglass-enclosed driver and two shoulder-mounted, high-firing 1" tweeters. The sub enclosure's sub port (left) and back surface, crossover section deepest and amplifier section on top. In the interest of weight conservation, we took the more-than-sufficient battery capacity down from 10Ah total to combined 7.4Ah over two units. Outside of that, the unit was over-engineered by design. All components were solder-welded and heatshrunk over 12awg twisted-pair wiring. The batteries were run across a quick-disconnect harness for easier use and the sub enclosure had a kill switch embedded. It was, in a word, nice. First coat on the enclosure exterior. Sadly, though, we never finished Model B, although I've been itching to try. I still have the enclosure and electronics ready to go, but I seem to have lost track of Mr. Jackson and his luddite tendencies make him a hard man to find. If you have an industrial sewing machine and a taste for bass, drop me a line. Maybe we'll make something of this without getting electrocuted.